Traditional surgical procedures require large incisions for surgeons to see the problem and fix it. While the dawn of laparoscopic surgery paved the way to shorter recovery with smaller incisions, some operations were still extremely difficult to perform—until the medical community invented robotic surgery. This minimally invasive, precise surgical approach has changed the outcome of many procedures. 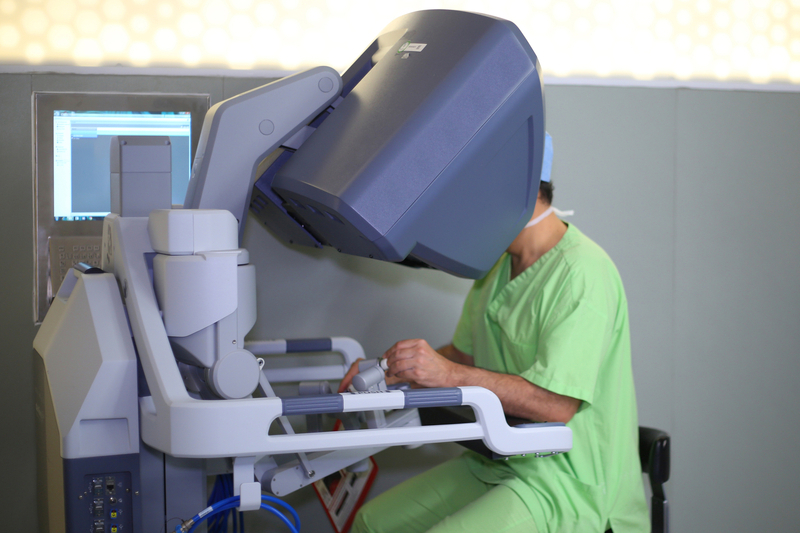 Robotic surgery—more specifically, robot-assisted surgery with the world’s most advanced surgical robot, da Vinci® Si—has been an FDA-approved procedure since 2000. The technique typically uses mechanical arms with surgical instruments attached that the surgeon controls from a computer, and a camera arm to give them the best possible view of the surgical site. The console that surgeons work from immerses them in the surgery with a high-definition, 3D, magnified view of the robot’s work, while two master controls give them fingertip precision. Other surgical staff assist during the operation based on the instruction of the head surgeon in charge of the robot. 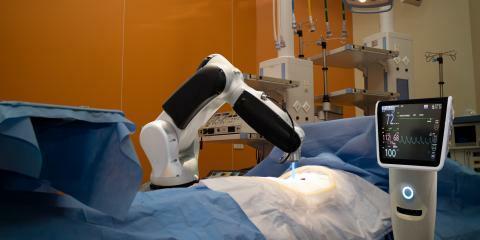 Compared to traditional techniques, the robotic system allows surgeons to see the surgical field better, and by extension, they can operate more precisely. By having an “eye” right at the surgical site, surgeons can perform more technical and delicate procedures that would otherwise be nearly impossible. The display can also show up to two diagnostic images of the operating site—like an ultrasound or CT scan—alongside the live view of the surgery, which can be a valuable tool during more complex procedures. Plus, the robot has a third surgical arm, giving the doctor 50% more operating capability, and it can filter out involuntary tremors from surgeons’ hands to cut the risk of accidental nicks and punctures. The da Vinci also has a function that changes the scale of the robot’s movements. For example, a three-to-one scale will have the robot’s arm move only one inch for every three inches of a surgeon’s hand movement. With this amplified control, along with the unprecedented viewpoint provided by the camera arm, surgeries performed with robots are minimally invasive. The robot operates with miniaturized tools that fit through a series of quarter-inch incisions to get the job done, resulting in a quicker recovery and less scarring after the fact. Since robotic surgery only requires these small incisions instead of a long one, your body is less exposed—and as a result, less susceptible to infection than during a traditional procedure. Less blood loss occurs during minimally invasive procedures, as well, which generally allows you to avoid a blood transfusion and other complications that arise from blood loss. Historically a painful procedure with a sometimes lengthy recovery, hernia surgery has benefited greatly from the use of robotic surgery. This condition, in which an organ breaks through a tear in surrounding tissue, previously needed a large incision to see the affected area, replace the organ where it belongs, and repair the tissue. With the help of the robot’s camera arm, surgeons can see the operation site clearly without open surgery, often shortening hospital stays and recovery time. Conventional colon surgery can be very invasive, as surgeons need to open up the abdomen to access the organ, and it can result in at least six weeks of recovery. With minimally invasive robotic surgery, the operation results in less pain, a faster return to a solid-food diet along with normal bowel function, and a shorter overall recovery. Similar to the other types of surgeries listed above, this procedure is traditionally more invasive because it’s in the abdomen, which can result in a longer recovery. Robotic surgery minimizes these factors and helps simplify the removal of any gallstones found in the common bile duct between the gallbladder and the liver before closing it off.